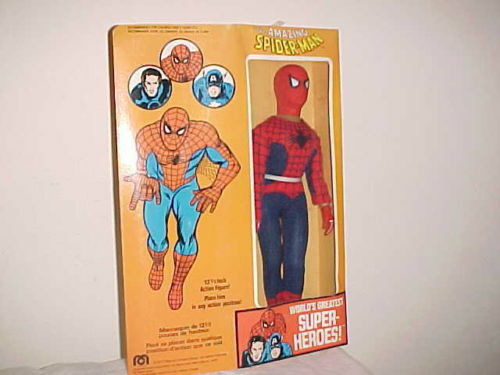 Item: Vintage 1979 Mego 12" Figure SPIDER-MAN In Original Box. This is very hard to find still attached in his original box! It has been lifted out of box on the card it's strapped to, but not removed from the card. Box is in really good condition for being 32 years old. Light scuffs to the box. Clear window perfect. The box reads - 'you can place him in any position'.Extremely rare to find in original box! Description: MEGO 1977 MARVEL COMICS GROUP. AMAZING SPIDERMAN 12 1/2 ACTION FIGURE HE IS MINT IN THE BOX NEVER REMOVED THE BOX HAS SOME WARE, NO TARES ON THE PLASTIC WINDOW. Item: The Amazing Spiderman- Mego, MOC 1979 French issue. 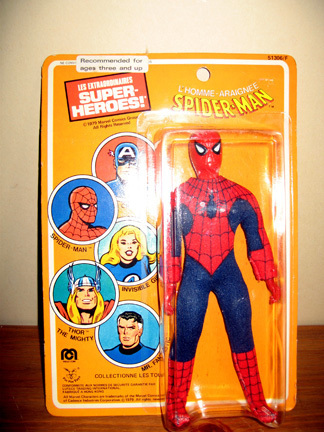 Description: The Amazing Spiderman - Official World's Greatest Super Heroes - Mego 8" poseable action figure - Mego Toys- 1979 - MOC (Mint on Card)- French issue card - Manufactured by Mego. The card is in excellent condition. On top of the bubble, there is a little residue from the department store sticker. AWESOME PIECE! SEE PICTURE! VERY RARE FIND!! See pic and ask questions, all vintage items sold as is. 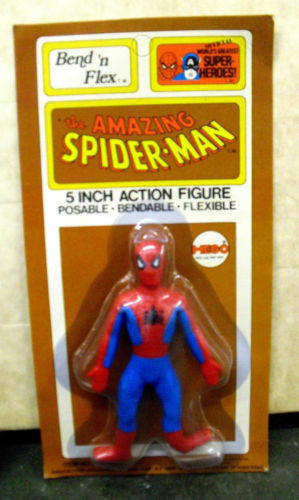 Item: Mego Spiderman Bend n Flex Figure MOC. 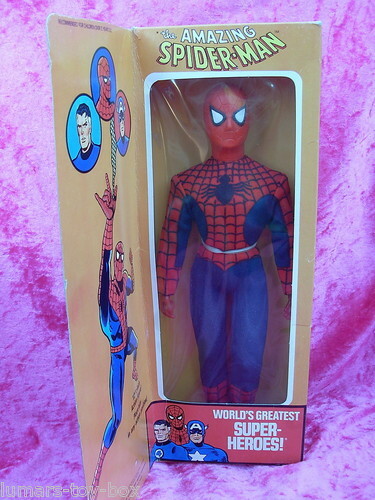 Description: An unused, all-original 1970s Mego Spiderman Bend 'n' Flex action figure from their World's Greatest Superheroes Line. This toy was never played with and has been stored away in a box for decades. It comes from the estate of a grandmother-- either she or her husband, at some point, bought these and stashed them away, perhaps intending to use them as Christmas presents. They have been out of the light and boxed away probably since they were originally purchased in the 1970s. Condition: The figure is completely unused and carded. The hanger is still present. Light wear on package. Bright, clean card. There is a dent in the blister above the figure's head. Figure shows light wear where it touched the blister. The bottom corners are slightly dented. (SEE PHOTO). There is a wrinkle in the upper right-hand corner. If you have any other questions about this item's condition, please let me know. 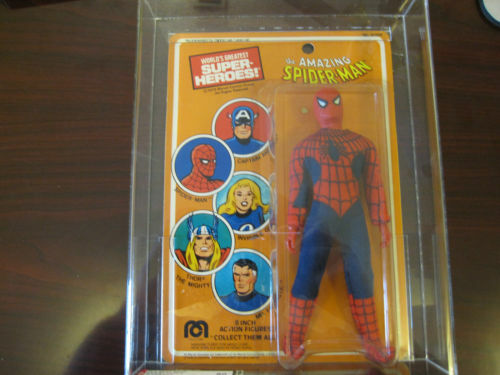 Description: Up for auction is a 1979 Mego Spiderman mint on card . It is afa graded an 80. The sub codes are card 80, bubble 85, Figure 85. The bubble is firmly attached and clear. It has the upgraded Archival case but the case does have a light 3/4 of a inch scratch. The scratch is on the left edge of the case about half way up. The scratch is slight and less than an inch. Mego Elastic Spiderman Stretch Armstrong figure. Stretch Armstrong World Exclusive Mego Spiderman Sale! You will love the Box Copy,its even better than the origianl boxes.very solid and square with bright clear graphics. You will Love the Spiderman figure and you get a bonus origianl Spidey Box! Item Description: Very Nice Carded Spiderman action figure...sewn on sleeve's variant...comes on the 1979 Pin Pin Card....bubble is pushed in on spots (including top over Spiderman's right shoulder)..also slight indented bubble at the figure's right leg...some sticker residue from where the price was...some wear in spots on card...real nice Orange color to the backer card and figure is mint inside..untouched and never opened..look at the pictures and feel free to email me with any questions..free shiping in continental USA. 1972 Spider-Man Mego KRESGE AFA 80NM - MUST SEE!!!!! 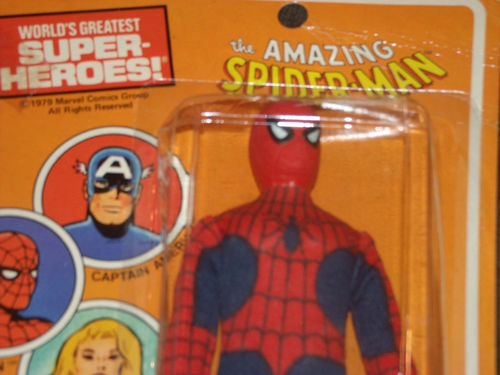 This item is a gem for any Spider-Man (Mego) collector. The AFA case was upgraded to a UV Protection Case. Going down memory lane on this one. 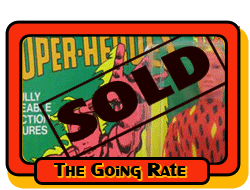 This sale is for the Mego Batcave and Supvator used for 8 inch Mego action figures back in the 70's. I am the original owner of both of these sets. First on the Batcave: This is not a complete set. What you get the batcave and the wooden bat pole. It does not have the bat computer nor does it have the bat signal. The set is in good shape. No tears that I can see. The box is in good shape but it does have magic marker writings on the inner flap where it looks like my dad tried to sell it in a yard sale years ago. It does show the original 1974 price tag of $12.99. 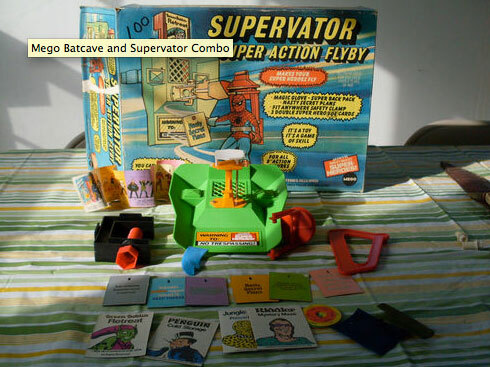 The second is the Mego Supervator with the original box. The box does have magic marker writing on it. This one is also missing parts such as the original string and the backpack and belt. It may also be missing some of the secret plan cards. I believe the set came with two blue gloves but I only have the one. It also has the instructions but it's not pictured. Let me know if you have questions or need additional pictures. As always we start the bid at $0.99 and let the Ebay market decide it's worth. All times are GMT -5. The time now is 3:28 AM.